From MailClark settings, you'll have a chance to set up your signature and sender name. You can also manage your communication preferences from there. - Or click on an account to access the options attached, including the "Disconnect" one. The O365 Mail adapter comes with filters options and the ability to enable (or not) original email in replies. 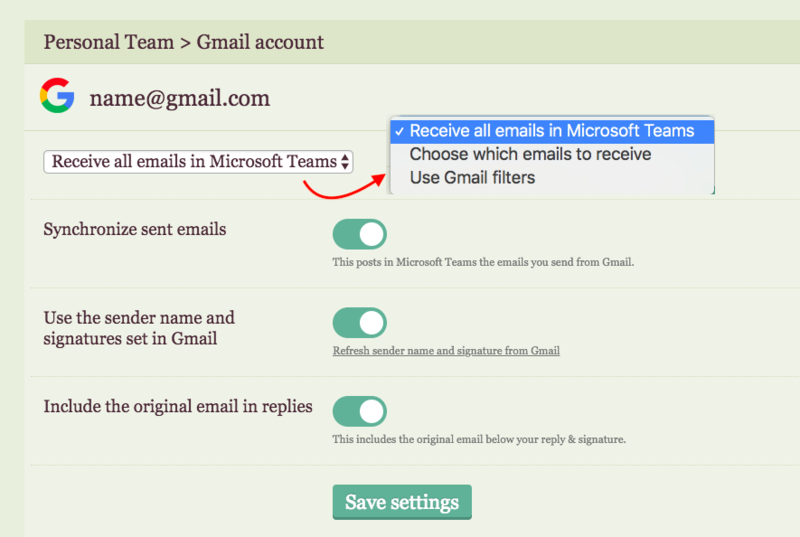 - Decide if you want to post in Teams the emails you send from Gmail. - By default we'll use the sender name and signature you've set in Gmail. You can decide to use another one for messages sent from Teams. - Choose whether or not to include the original emails in replies. Once you've connected your email account using IMAP, set up your signature/sender name and decide if you'd like to include the original email in replies. When you create an email address with MailClark, we let you customize the left part of the email address. As for the other emails account, you can decide whether or not to include the original emails in replies and set up your signature/sender name. The Facebook adapter comes with a option to synchronize sent messages: This posts in MS Teams the messages you send from Facebook. Once you've connected a Twitter account, choose which messages you'd like to receive in the channel: Only Mentions, only DMs or both. You can also decide whether or not to post in Microsoft Teams the messages you send from Twitter. How to set a default sender name and signature for the team?